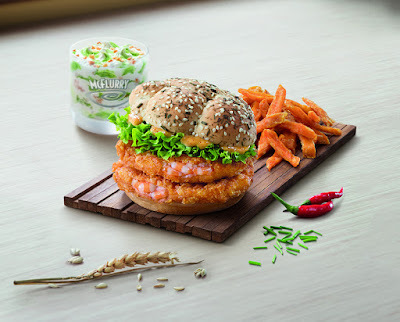 In September 2015, McDonald's Singapore bought back the Ebi burger this time, not with Wasabi, butrather a sesame sauce & cereal bun together with the Honeydew McFlurry, so my absence from Singapore wasn't overly disappointing as I had already tried both of those items before. What they did introduce however, were Sweet Potato Fries which were new to Singapore although I had the 2014 release in Australia. I thought I was going to miss them as when I returned to Singapore in October for a business trip, they had already killed the new Ebi Burger, and replaced it yet again with the perennial Samurai Burger and there was no mention of Sweet Potato Fries anywhere on the website. It looks like they were still available at a handful of branches, and word on the street is that these will be a regular menu item in the near future. They are also going to start a run shortly in Korea, so I wouldn't be too surprised if they start spreading out across Asia over the next couple of months. My boss ordered McDelivery, so I didn't actually order these in a restaurant, but rather was able to steal a few in order to give them a try. The biggest difference between these and the Australia release was the quantity. I complained about the quantity of wedges in Australia and at least here you were served a decent size box full of fries, so although they were still quite pricey at almost $4 for a box, you ended up with more than a couple pieces. 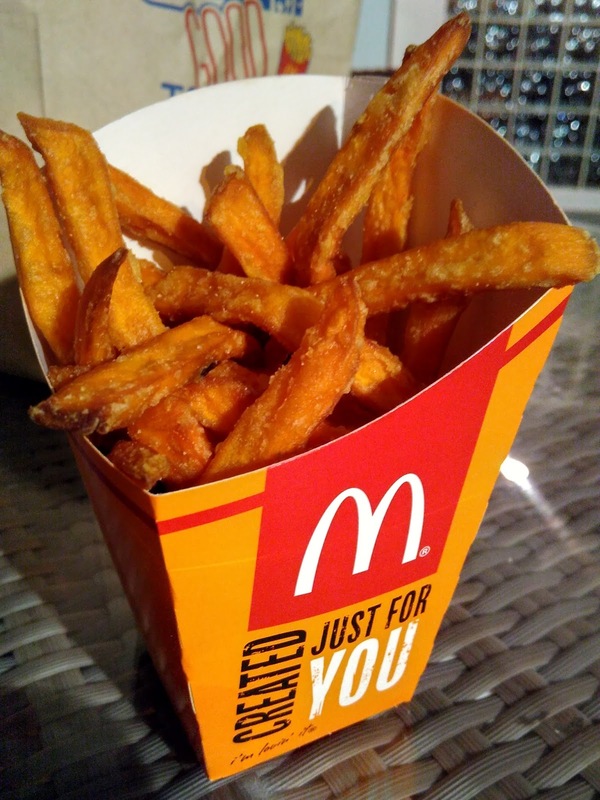 They were cut far smaller than the wedges in Australia, and although slightly thicker, were not really much longer than a traditional potato fry. These smaller pieces meant you had less potato inside than you'd expect for a Sweet Potato Fry, so each individual fry didn't have all that much flavour to be honest. Another big change was that these were hardly salted at all. 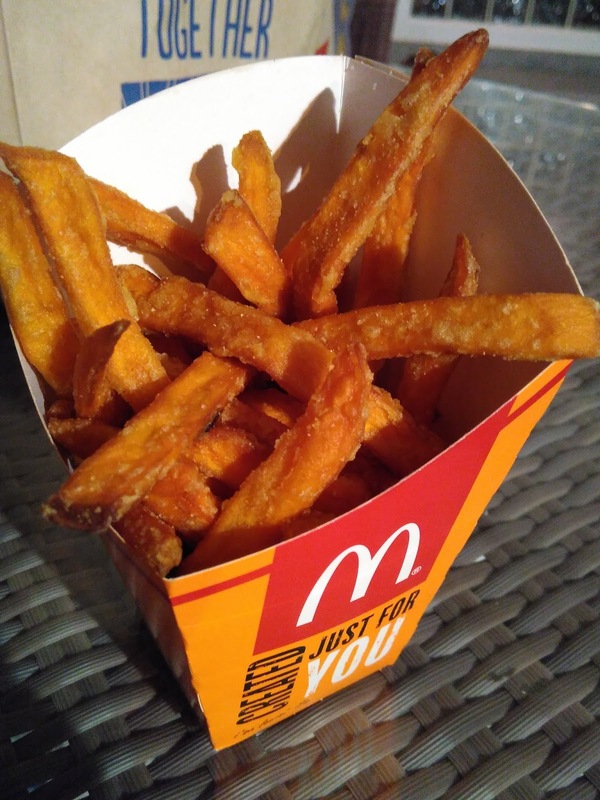 I usually find standard fries in Singapore to be overly salted, so that was a nice change. Also, since they were delivered, they were far from fresh. I wouldn't be surprised if they were cooked about 45 minutes or more before I was able to try them, so these ended up a soggy, limp, mess. I'll probably have to stop by McDonald's before I leave Singapore, so I might try them again properly, but as they sat they were far from great. This is a very nice post. Thank you for sharing this. Love the food. It's look very delicious. Thanks for the information. Hope your next blog will published soon. Waiting to your nice blog.